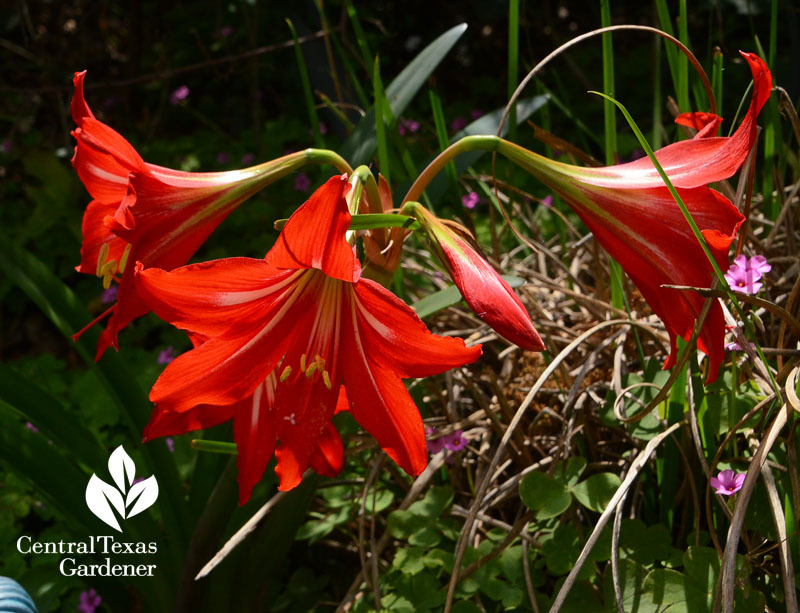 The bulb parade continues with Johnson’s amaryllis (Hippeastrum x johnsonii), a reliable comeback in sun to part shade, even on my Blackland Prairie soil. This one gets bright shade most of the day until late afternoon when sun blasts it. Around town, I bet you’ve seen this a lot: cycads (sago palm) with striped brown leaves. 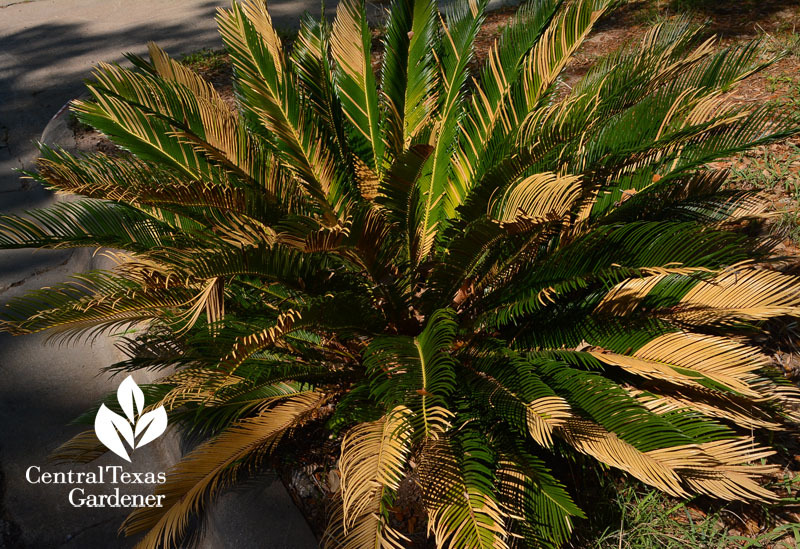 San Antonio gardener Rebecca Savage’s cycad looks about the same. This is freeze damage. Simply cut off the bad leaves to the trunk. New ones will emerge. Long rose gloves make the chore less painful! 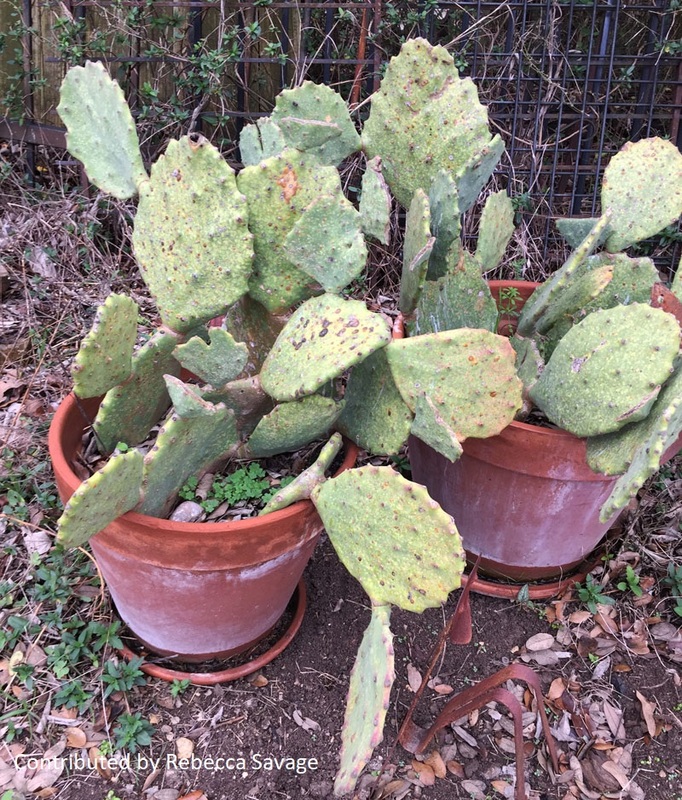 But Rebecca’s spineless prickly pear is in big trouble. Daphne explains what to do about it and how to protect sago palms during extended below freezing days. 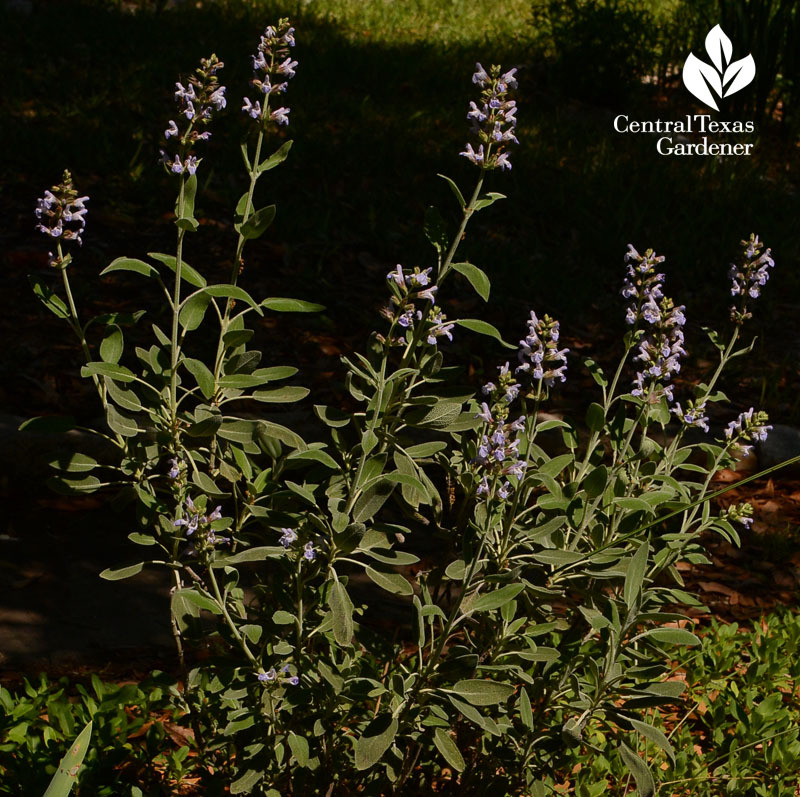 In my experience, native Texas sage/cenizo (Leucophyllum frutescens) can be really ugly or very handsome, like this one. 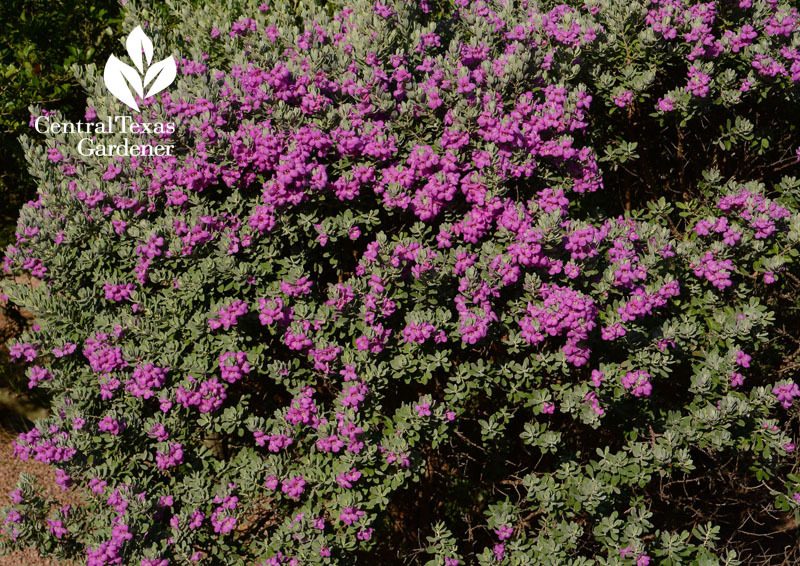 Although the flowers don’t guarantee rain—just high humidity—they do promise lots of bees and other pollinators. Daphne explains what you need for a beautiful, drought tough cenizo. 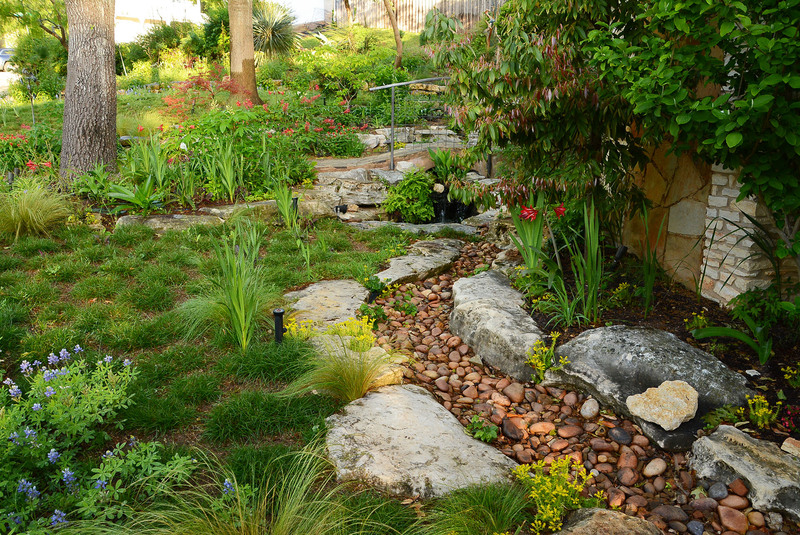 Rain drenches, especially in heavier soil, can take out our silvery plants quickly. I lost a Salvia ‘Newe Ya’ar’ (a hybrid of S. officinalis and S. fruticosa) to a rain bomb last year. Just 17’ away at the end of the bed, this one didn’t even wilt, or suffer during our extended 20° days this winter. 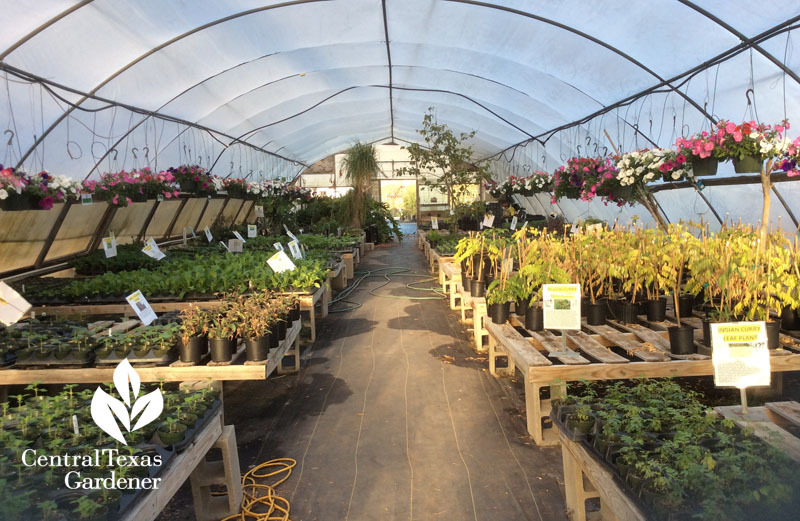 Lack of sun, space or good soil is easily remedied by growing in containers. There are countless new hybrids of miniature/dwarf vegetables that work fine in a container in a sunny spot (even along a driveway). 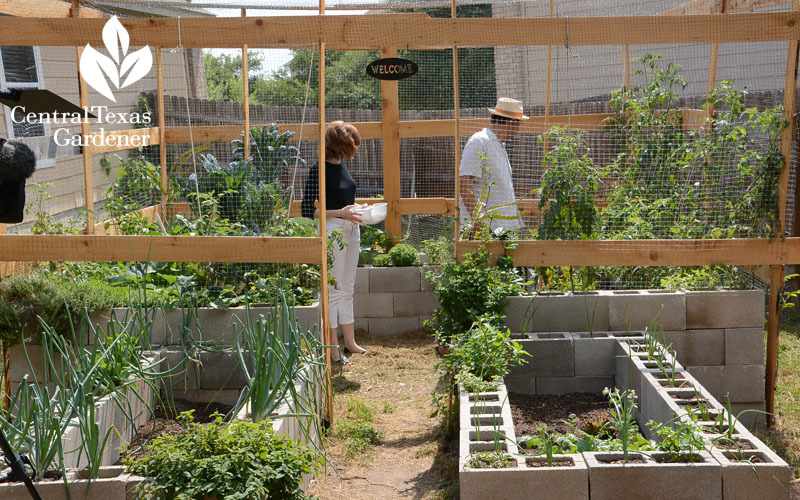 John demonstrates a few options for small spaces, including tomatoes in bags! As “super foods” enter our dietary vocabulary and recipes, we’re curious how to actually grow them. 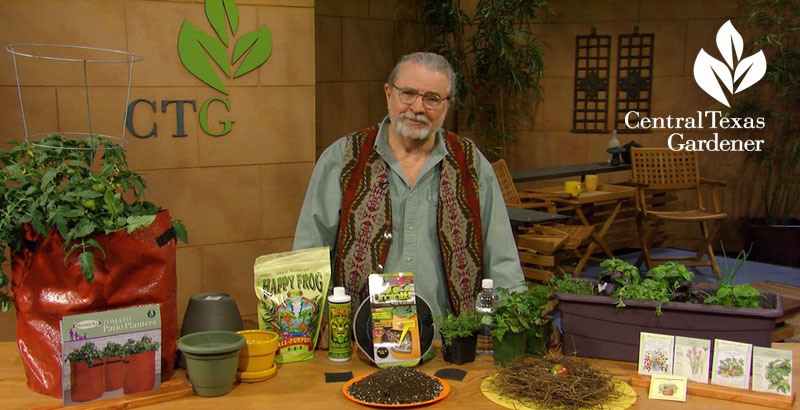 David K. Sargert from It’s About Thyme explains how to grow plants with powerful benefits. 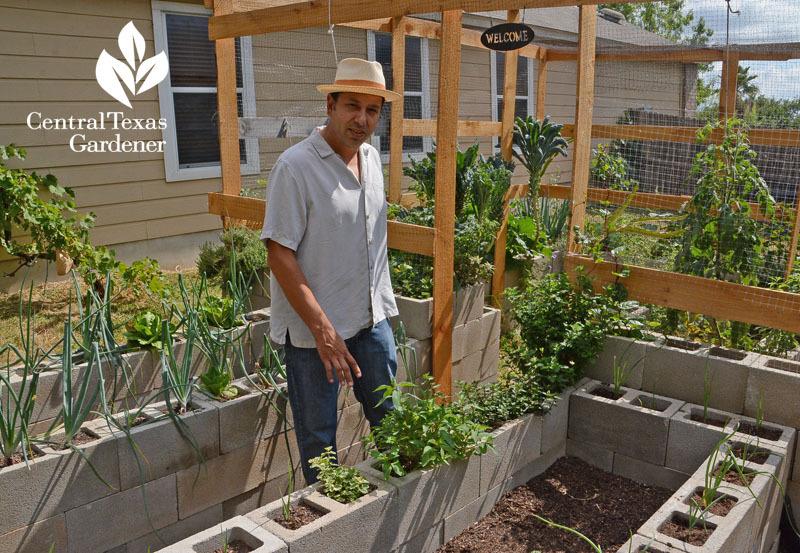 A LEED semi-retired architect, David wanted to learn more about gardening organically and to find solace in growing plants. 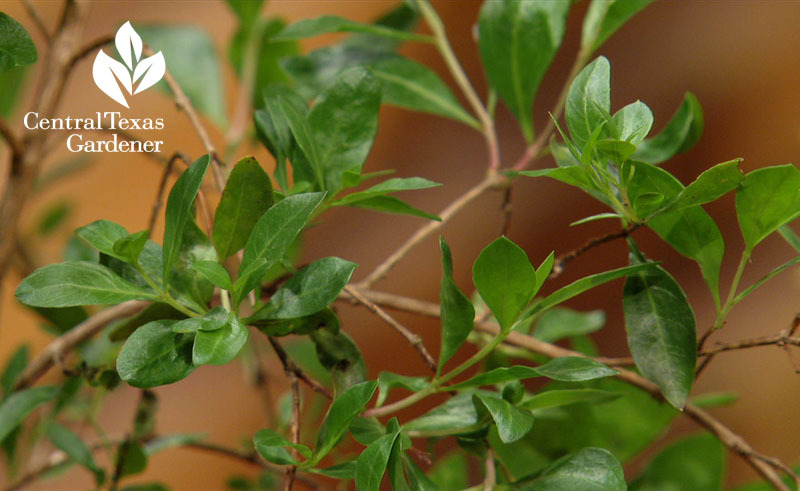 He joined the IAT team and began exploring healthful plants, many with origins in India. 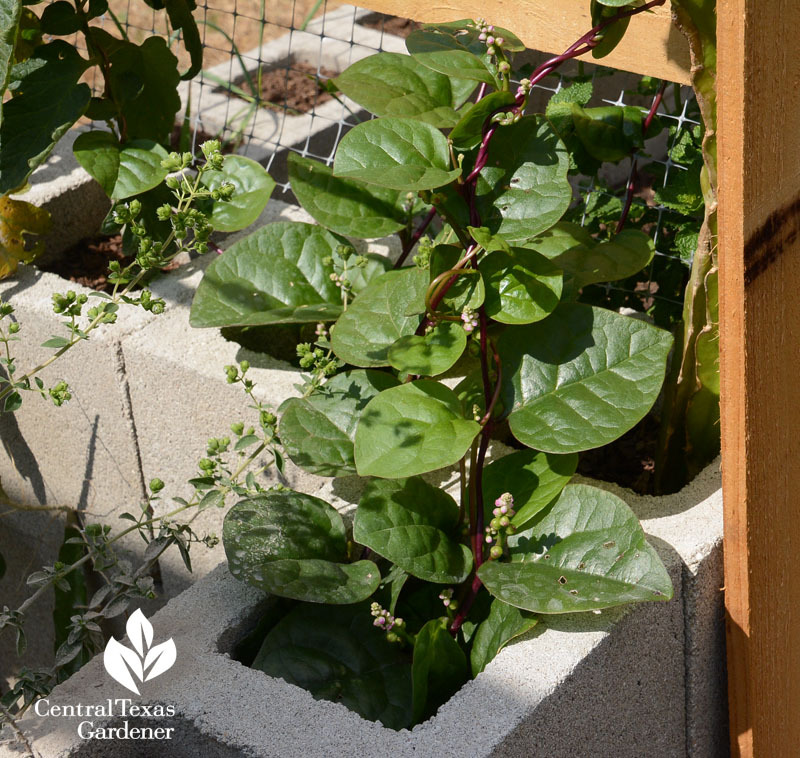 Discover how to grow gotu kola, snake gourd, bitter melon, amaranth, neem tree and curry tree. 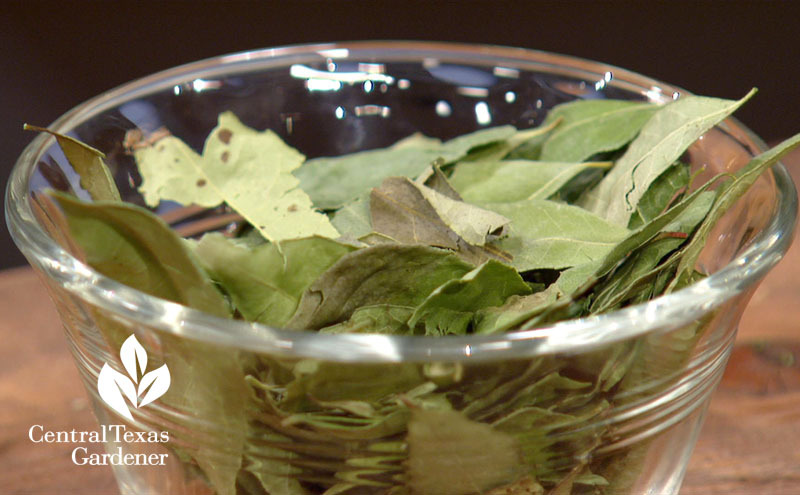 His dried curry tree leaves were a hit at KLRU and flavoring many recipes right now! 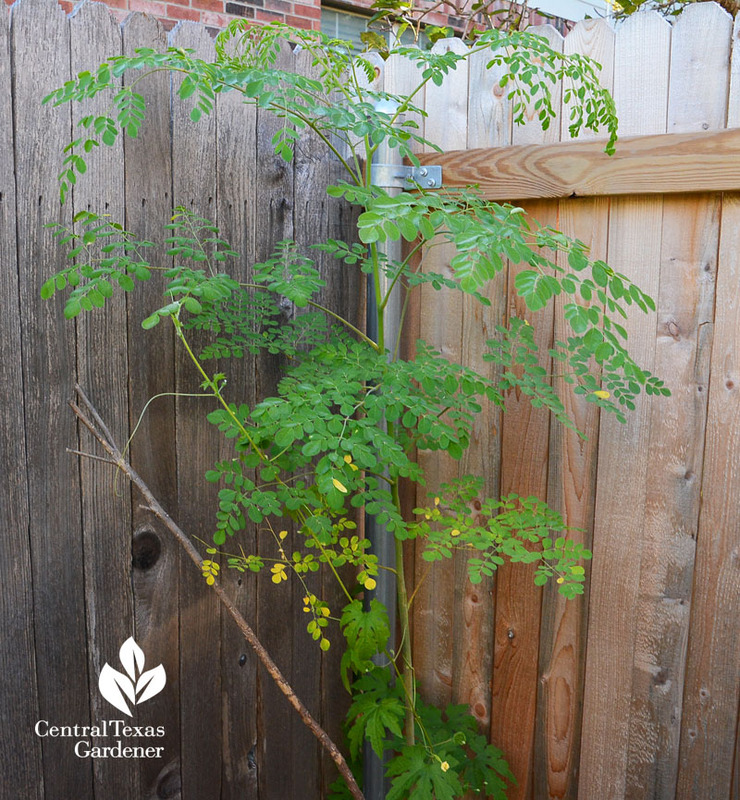 Tender tropical moringa’s one of the most super of the super foods and quite easy to grow here. This one’s in Ratna and Venkappa Gani’s garden. David brought along tender tropical henna, popular for homemade tattoos and coloring hair. 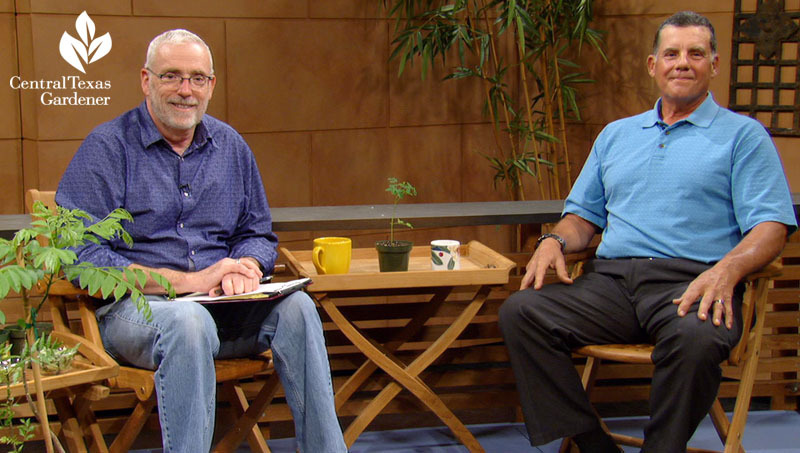 Watch now for the scoop on super plants! 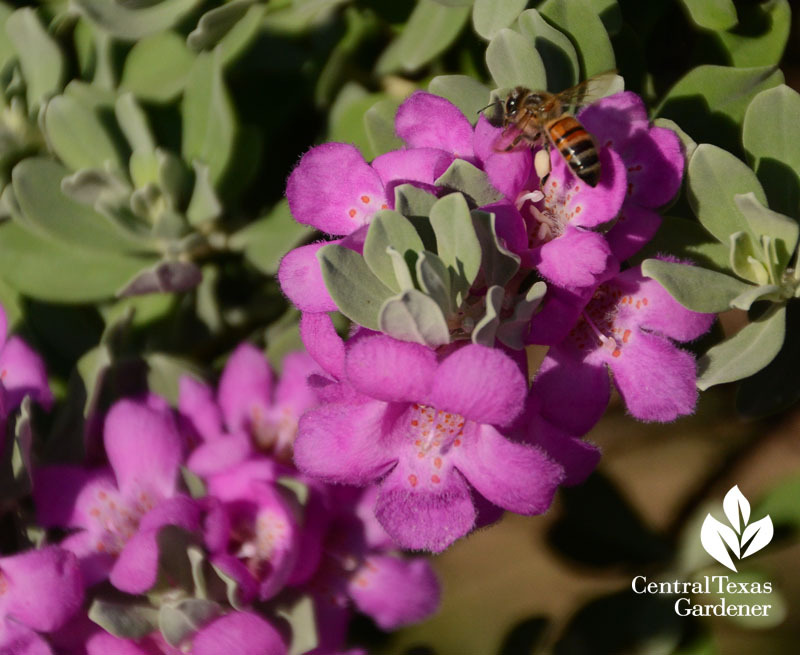 Check out David’s remarkable plant photos on Facebook! 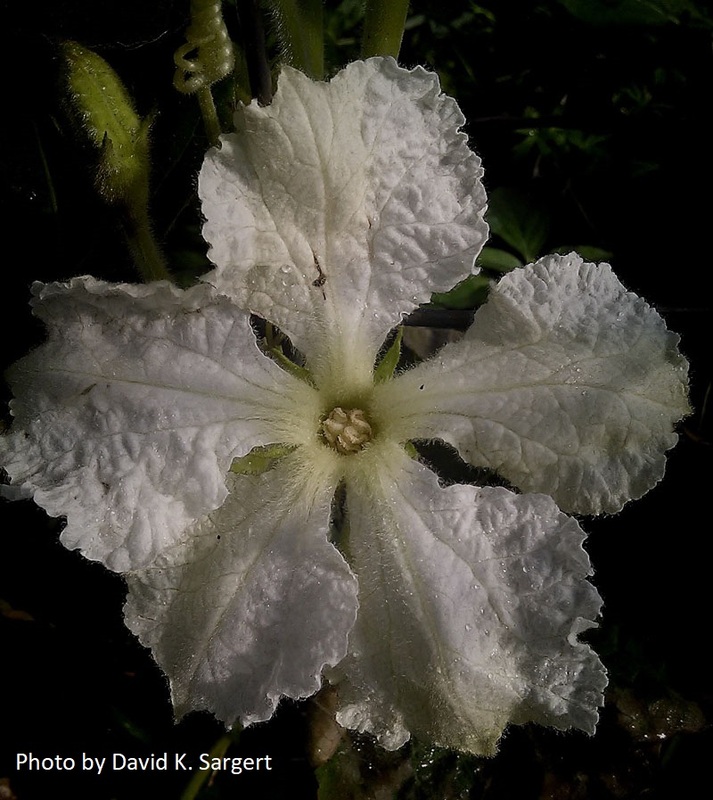 This one’s the flower of Viper snake gourd, one that he includes on CTG. 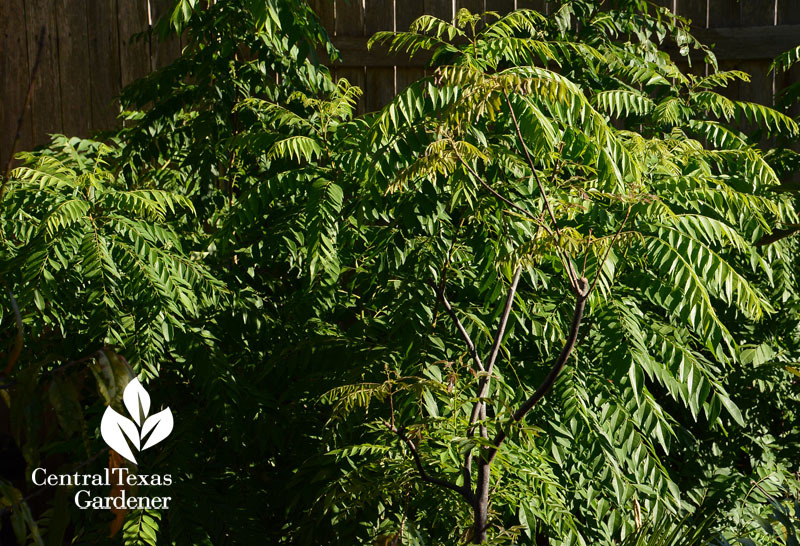 In case you missed it, see how Ratna and Venkappa grow many of these plants, including curry tree. 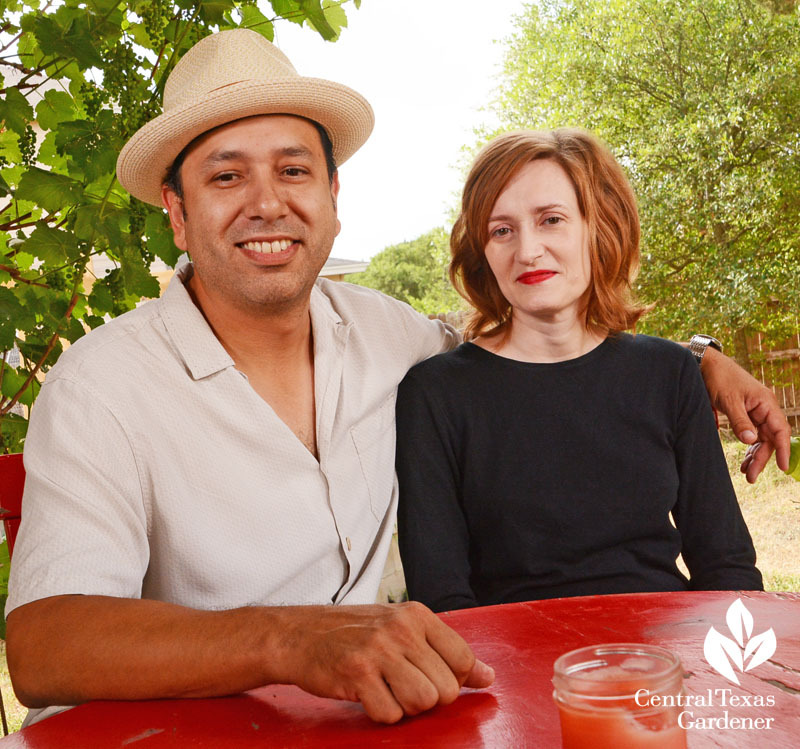 On tour in San Antonio, Christine Cunningham Alcorta and Richard Alcorta found a solution for growing on rocky soil: cinder blocks. 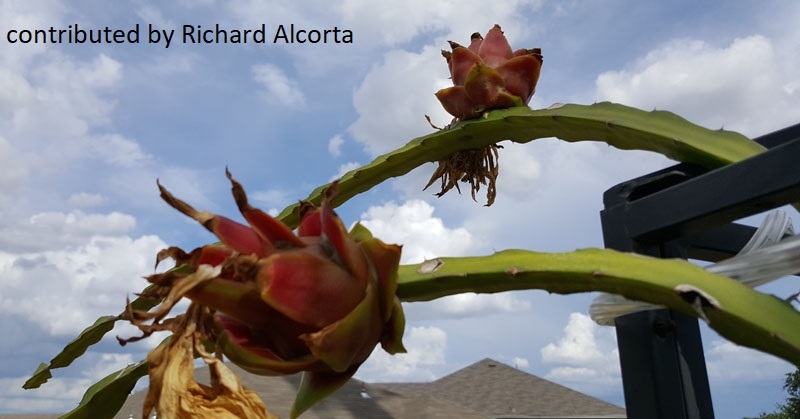 Richard loves to cook and they both wanted the fresh tastes of pick-to-kitchen choices (like super hot peppers) that aren’t readily available in grocery stores. 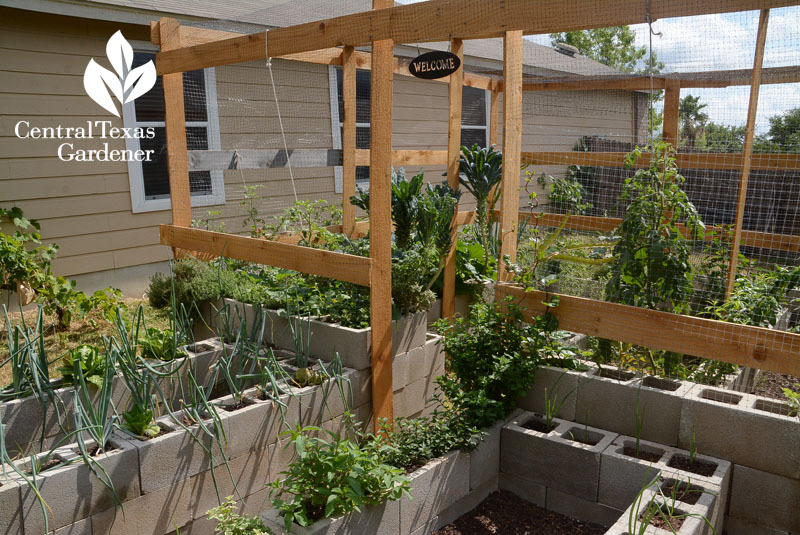 To protect their many varieties of tomatoes and other critter-beloved crops, Richard built a cedar frame to anchor plastic Poultry Hex garden fence netting. 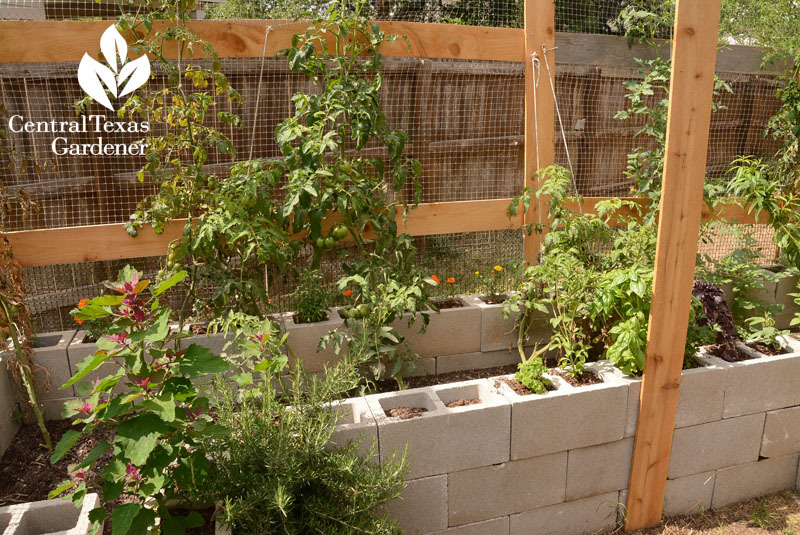 Rather than caging his tomatoes, he strings them up. Makes harvesting easier, too! 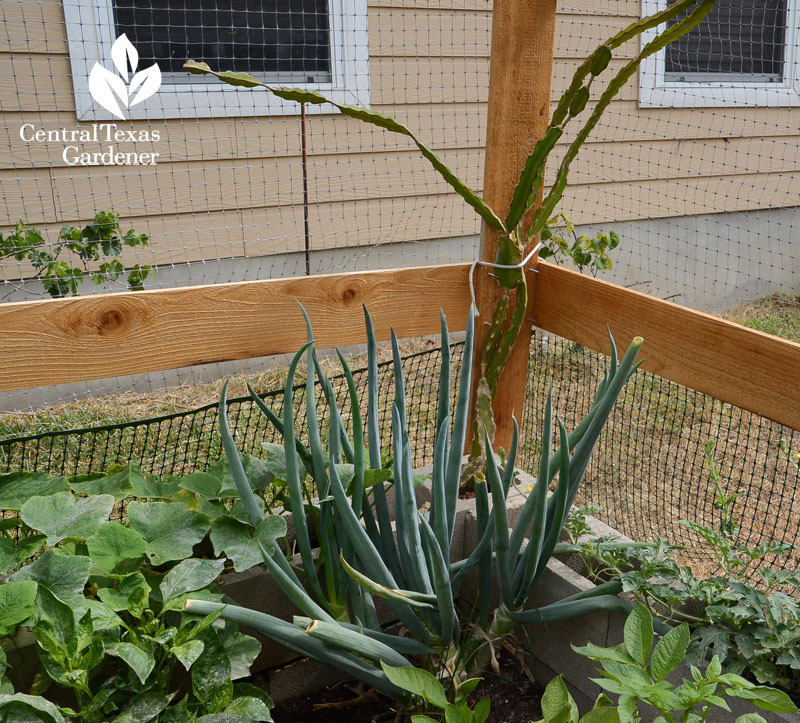 The netting also works for climbers like squash and summer Malabar spinach. 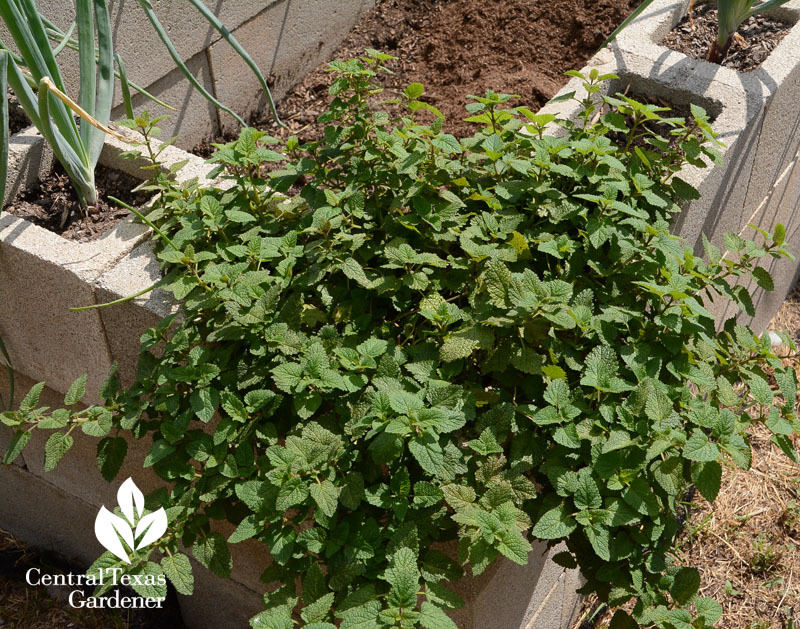 Compost-enriched cinder blocks confine ambitious herbs like mint. 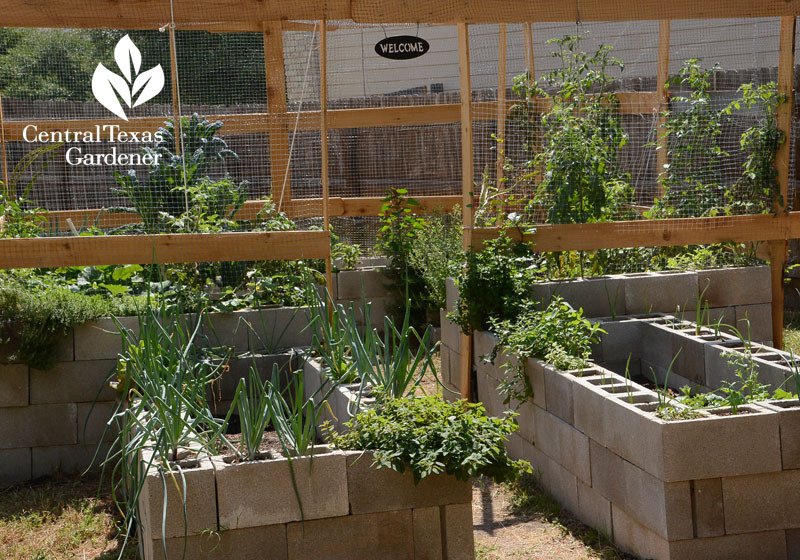 The deeper middle beds support crops like potatoes. There’s always something in season for Richard’s 5-star recipes. 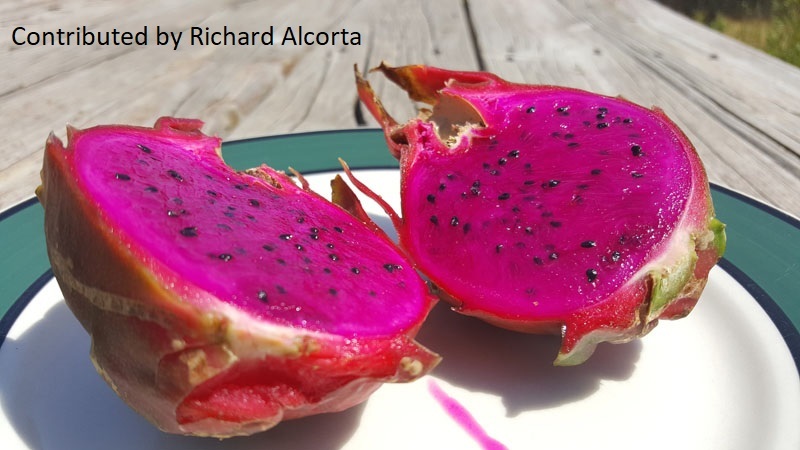 Asian dragon fruit, a genus of cactus, is the only plant they protect from freeze, aside from their citrus. Its glorious flowers produce sweet, richly colored fruit in summer. 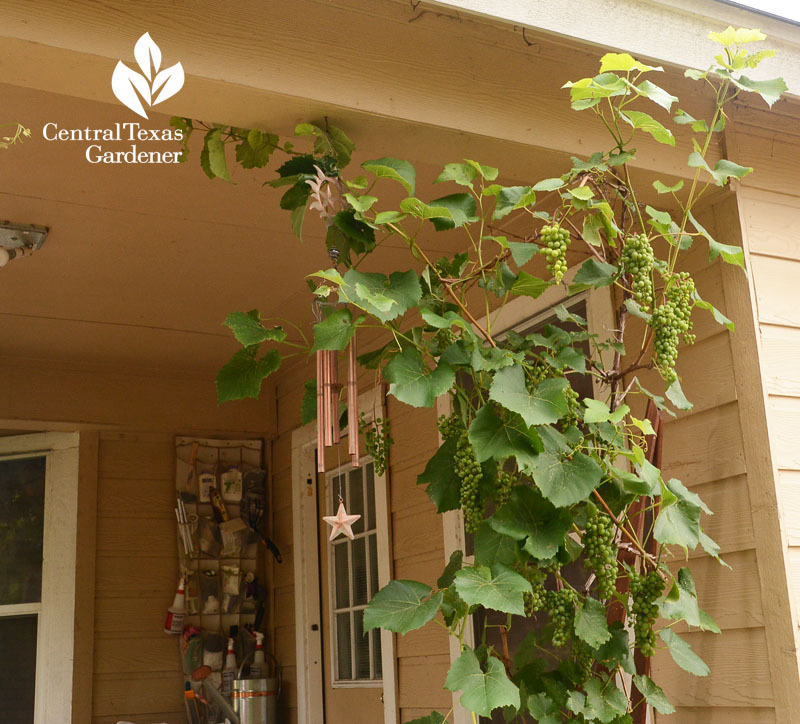 Table and wine grapes work well in their rocky soil and even shield the patio, where plucking is easy. 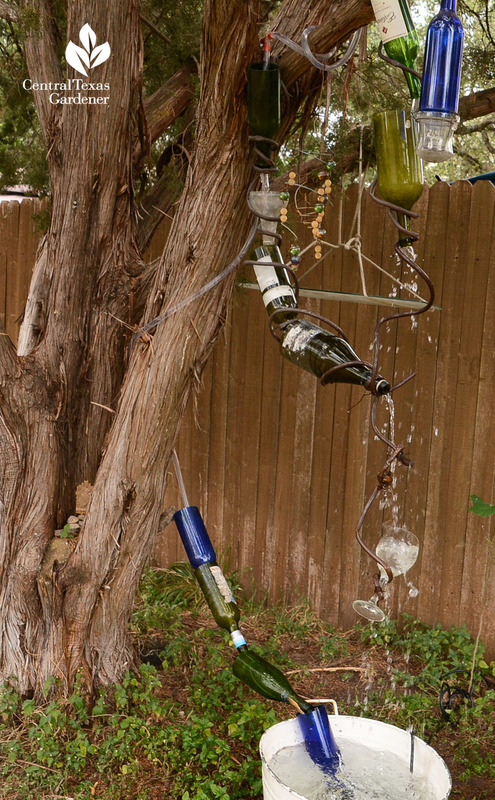 Since they welcome beneficial wildlife to their flowers, Richard devised a wine bottle waterfall where birds and small creatures hit the bottle! 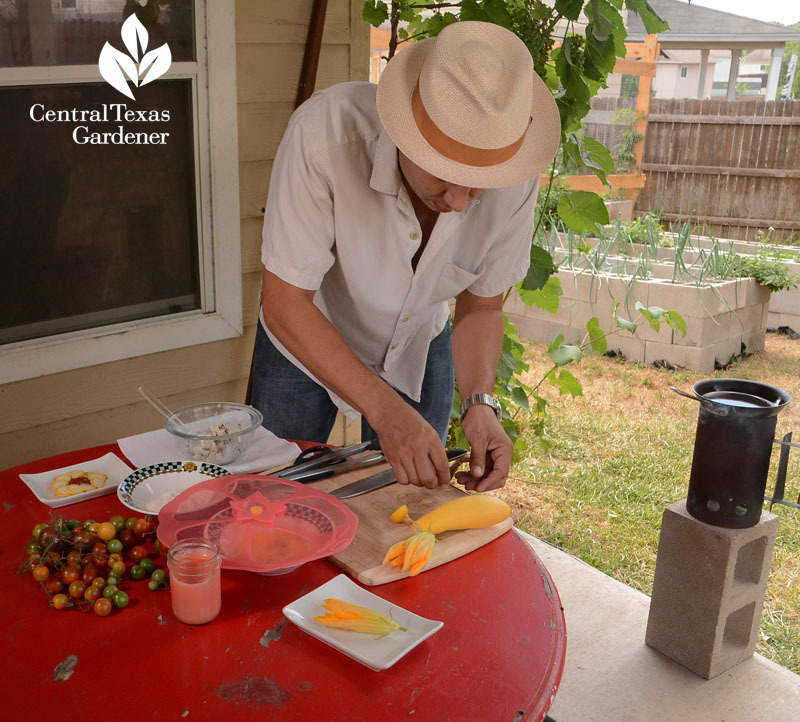 See how Richard and Christine fry up stuffed squash flower blossoms! Watch their wonderful story right now!